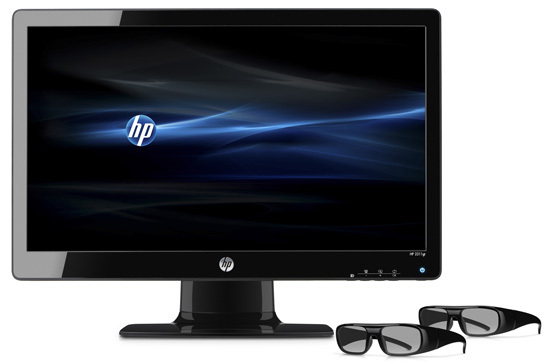 The new HP 2311gt 3D 23-inch LED backlit monitor turns any PC into a 3D gaming and movie center. The 2311gt uses passive 3D glasses (two are included in the box), which are comfortable for long wear and inexpensive to replace. And, at only $299.99, the monitor is not much more than a standard 23-inch. Unlike other 3D options on the market, the HP 2311gt works with any graphics card that supports DirectX 9 (which almost all recent PCs do), so it's easy for anyone to get up and going. Instead of using the card for 3D, conversion software (included) handles the task. When I tested the monitor at a recent HP event, I was impressed by the 3D quality. Games were artifact free and provided a great sense of depth. There wasn't video content to evaluate. The HP 2311gt w3D will be available on November 8th.